Mackie Academy library is situated in the Maths corridor, up one flight of stairs from reception. The library is open from 8.15am before school, break, lunch and after school till 4pm where there is always a member of staff on hand to help. The library is a central resource with over 6,000 items including books, graphic novels, audiobooks, study guides, past papers and a careers section. There are 10 computers pupils can access, for work or recreation. 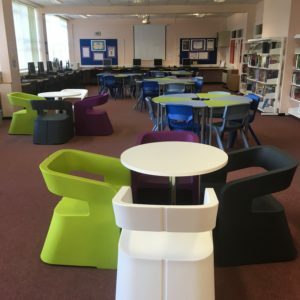 There is a senior study area with a further 6 computers for pupils to access during study periods. Tea, coffee and water are provided during exam study leave to encourage hard work and staying power! The library is an integral part of teaching and learning. Through S1 inductions, partnership working with teachers and pupils spending time in their library they will develop lifelong learning skills, information skills, and discover a love of reading. Pupils visit the library during class time to choose books for reading for pleasure or finding information and to use the computer. There is an active Library Council, consisting of staff and pupil representatives. This group acts as advocates for the library and helps organise events such as the Book Fair and activities during Book Week Scotland. The library houses a stationery shop so if pupils forget a pencil, rubber, ruler, calculator etc, no need to panic! The library is a busy vibrant place and with author visits, book fairs, board games, puzzles for house points. There’s always something going on for pupils to get involved in!